The southern end of Palm Beach is an amazing place to stay and with a focus on young families and affordable water front holidays, Blue Ocean Apartment is loaded with all the extra's families with young children need as well as extras for the not so young, to make your holiday easy and relaxing. On entering the apartment you will immediately see holiday views of palms, beach, sand and surf. Opening the sliding doors lets the ocean sounds and the cool sea breeze fill the apartment giving you the feeling that you have arrived at your beach holiday. Blue Ocean Apartment is recently renovated with a large, modern open plan kitchen family area, main bedroom with ensuite and second bedroom with 2 single beds. Both bathrooms have also been given a contemporary makeover. The new queen ensemble was chosen for its cool fabric comfort top. Two three seater leather lounges allows you to stretch out and enjoy the cool sea breeze drifting through the sliding doors while you relax and enjoy the 46" LED TV or the ever changing ocean views. The fully equipped kitchen should make holiday dining easy. All rooms offer impressive views of the beach, Surfers skyline, Currumbin Rock and lagoon pool. There are 2 balconies ; a large balcony opening off the family room and another smaller one off the main bedroom. Attention to detail to ensure your holiday is relaxed and easy has been the driving factor for the owners so the apartment is filled with those extra touches. You can laze away on the deck or by the pool, read a book, take in the pool and ocean views, or take the kids to the beach which is only 60 metres away with no road to cross. The crystal clear waters of Currumbin Alley are just around the corner if you are looking for calmer water for swimming or other water activi-ties. Blue Ocean Apartment is an Independently owned and operated Apartment within a larger resort complex with a fan-tastic Heated 33 metre lagoon pool and spa area offering pool side BBQ and entertaining facilities. As your body settles into the comfy, cool fabric, soft top mattress you will know you made the right choice in deciding to stay at Blue Ocean Apartment. Please note the images displayed here and on our website are of the actual apartment you will be staying in and are intended to give you a good idea of the size and standard of accomodation on offer at Blue Ocean Apartment. Located on the 7th floor of the building enables the apartment to enjoy impressive views that take in a combination of the fantastic pool area, parkland area, beach, surf , ocean and distant skyline views of the Gold Coast that are sometimes lacking in more elevated apartments. 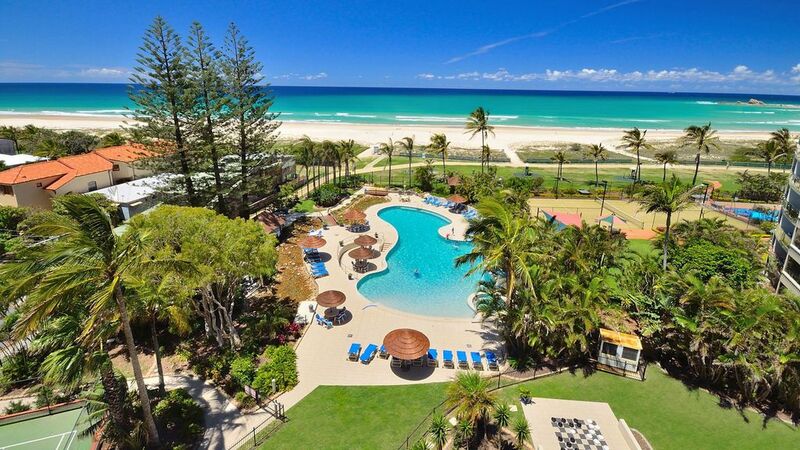 We have also included images indicative of the fabulous nearby Palm Beach Parkland area which is arguably the best beach spot location on the whole of the Gold Coast. - 1 x 46" LED TV and Blue Ray DVD player + 26" to Main bedroom. - Large balcony with panoramic Ocean Views. - Laundry facilities include washing machine and dryer. - Outdoor poolside shower, great for washing the sand off after a day at the beach. - Child Friendly with port-a-cot, pram, high chair and side bed rail. - FUNKY POOL SIDE BBQ Kit with wheelie Bag making pool side dinning easy. Why not make Blue Ocean Apartment your next holiday destination? What Makes Palm Beach a great place to Holiday? Palm Beach Parklands has benefited from considerable embelishments over the last 18 months which has transformed this already beautiful beach and river environment into a magificent family friendly parkland area that is now arguably the best beach spot on the Gold Coast. Their are so many options for you and your family to connect with the ocean , from walking trails that take in endless beaches, calm water safe swimming areas for children , funky gazebo's perched on the waters edge, riverbank bush reserves, wildlife sanctuary's , river board walks , open parkland areas , exercise points , sand dunes and rock wall features. Palm Beach on the Gold Coast is located 7 minutes drive north of the Gold Coast Airport and has a laid back beach holiday ambiance about it and yet retains that edgy city feel with funky cafe's and restaurants close by. With arguably the best surf club restaurants on the coast and an array of eateries to satisfy any foodies requirements its an ideal holiday location for families and couples alike. If relaxation is the priority and with the ocean at your door step why not try Blue Ocean Apartment - Palm Beach on the Gold Coast for your next holiday destination. Sleeps 4 Adults + 1 child on Foldaway bed Allowing 5 Max people. Minimum Stay 4 nights only in the off season weeks - May through August. When comparing apartment rates on the Gold Coast we have found that it is important to ensure that the room rate you may be negotiating on is a comparable apartment in terms of views, quality of inclusions and any additional features offered within the package. It is very common for guests to secure a great bargain until they check into the room. There is a great deal of variability in the standard of accommodation in the serviced apartment market on the Gold Coast as each apartment within these apartment buildings are individually owned and therefore present in a variable state of repair. If this is your first visit to the Gold Coast it is important to be mindful of these facts as on site managers are very sharp and know their market very well and have very flexible pricing structures to enable them to sell the least desirable apartments within their complex. We also provide additional information brochure’s to assist you when planning your holiday if you choose to stay at our apartment at Palm Beach on the Gold Coast, and to ensure you have a smooth arrival, set up and settle-in experience. We are here to assist you in making the right decision for you and your family so please feel at ease when contacting us with any questions or concerns you may have about our apartment and its suitability for your particular needs. We have a 6 seat dining table and balcony seating for 4. Incredible views. Superb facilities for kids. Older style accommodation without air-conditioning. Bed and pillows could use an upgrade and the cupboards need tidying! A compendium with useful information would also be helpful. The pool was warm, the slide perfect for our girls, Dune Cafe right next door has amazing coffee & croissants! The beds are so soft & comfortable & the apartment is really fresh & lovely. Thanks Fiona for such a great review of Blue Ocean Apartment. A great spot for the family. We had a 4 bed apartment. Plenty of room. Great pool for our grand kids 5yrs & 3 yrs old. Good BBQ facilities to use around the pool.